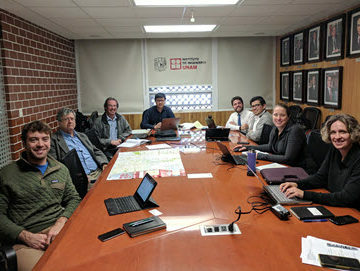 An ASCE Infrastructure Resilience Division team is in Mexico this week, gathering information about the region’s recent earthquakes to help engineers better understand how to make infrastructure more resilient. The team will be filing reports throughout the week to ASCE News. Follow the team on Twitter at #quaketeamASCE. 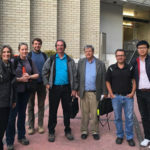 We kicked off the trip with a visit to the National Autonomous University of Mexico (UNAM) to meet with engineering professor Gustavo Ayala and architect Cecillia Valles. 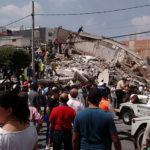 Prof. Ayala shared with us his extensive experiences following both the 1985 and 2017 earthquakes with regards to the performance of various lifeline systems throughout Mexico City. His insight provided valuable information covering both the technical aspects of the lifelines systems and the organizational structure of the various responsible agencies. Cecillia complemented this with her knowledge of and connections to agency and engineering officials in the city. Things really got exciting when Prof. Ayala brought in “El Subsuelo De La Ciudad De Mexico” or “The Subsoil of Mexico City.” This treasure consisted of a three-volume textbook full of field and laboratory soil data, historical foundation design methodology, and a thorough overview of the various geotechnical performance issues Mexico City continues to face. There was only one way to surpass a find like this, and Prof. Ayala led us to meet with one of the coauthors of the third edition, Prof. Edgar Mendez. Prof. Mendez provided an excellent overview of the geology of the Valley of Mexico and the artificial changes mankind has inflicted on the area. It is incredible to see just how much settlement can occur after 100 years of groundwater extraction in sensitive clay… Almost as incredible as [team co-leader] Allison Pyrch translating a 90-minute technical presentation given entirely in Spanish! Prof. Ayala kept the information coming with presentations from professors Oriel Arnau and Rafael Carmona. 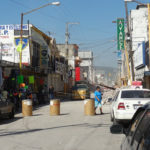 Prof. Arnau was one of the first investigators of the structural damage after both the Sept. 8 and Sept. 19 earthquakes. He shared with us his observations and experiences as well as some great information regarding the measured spectral accelerations in the varying geologic units across the Valley. Prof. Carmona keyed us in to the water infrastructure of the city. A complicated system of aqueducts, extraction wells, tunnels and gravity lines help bring water to the people of Mexico City. Prof. Carmona also provided an overview of the drainage system which removed drainage and wastewater from the Valley of Mexico to the Pacific Ocean to the Gulf of Mexico in the process. 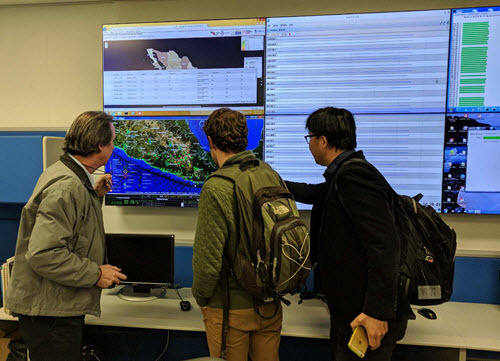 We wrapped up the day with a tour of UNAM’s real-time seismograph network, showing live output of seismograph stations across Mexico. Everyone we met from UNAM today could not have been more welcoming and helpful. 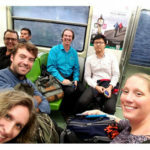 Day One gave us a great starting point to dive into the specifics of Mexico City’s resiliency response. Great day indeed. Looking forward to hear about building structural aspects from you. Very consecutive approach for very serious subject of Research Study! I personally look forward to have an access to data of your studies. I appreciate your team are sharing information. Sounds like a great kickoff; I look forward to reading more. Who else is on the team?